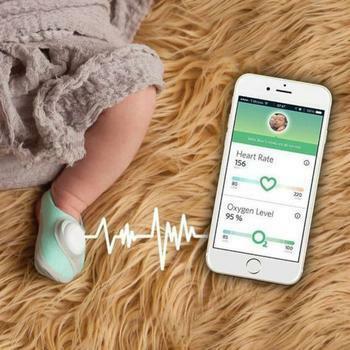 The idea of keeping tabs on a baby’s vital signs by strapping an electronic sensor to their sock may sound appealing to many parents, but pediatricians argue that there is little benefit to these smartphone-connected baby monitors. False alarms may frighten young parents and lead to unnecessary tests performed on healthy babies, said Dr. Christopher P. Bonafide. What’s more, there is no evidence that baby vital signs monitors prevent any potentially fatal problems in normal infants. “These devices are marketed aggressively to parents of healthy babies, promising peace of mind about their child’s cardiorespiratory health,” said Bonafide, a doctor at the Children’s Hospital of Philadelphia. In an article published recently in the Journal of the American Medical Association (JAMA), Bonafide and his colleagues compared claims made in ads for high-tech baby monitors with what these devices are actually capable of. The authors focused their research on five models of smartphone-integrated infant physiological monitors from names like MonBaby, Baby Vida, and Owlet. While manufacturers do not claim their products treat, diagnose, or prevent disease, a video advertisement for Owlet suggests otherwise. It mentions SIDS and suggests that the device may alert parents that something is wrong. These baby vital signs monitors have not been approved by the U.S. Food and Drug Administration -- and manufacturers can continue to avoid FDA medical device regulation because they do not claim that the monitors prevent SIDS, the authors explained. “Since these baby monitors are not regulated by the FDA, we have to question what testing has been done to assure the safety and quality of these designs,” said David T. Jamison, executive director of Health Devices at ECRI Institute. In response to the JAMA opinion piece, Owlet said that the company has performed “extensive product safety testing" and noted that its products are compliant with CPSC standards. "By giving parents the right information at the right time, we empower them to make informed choices," Owlet said, adding that the company’s mission is to "help parents take a proactive approach to their baby's health and wellness." Baby vitals monitors can often mistake a baby’s kicks, rolls, or a harmless fluctuation in their vitals as a life-threatening situation, Bonafide explained. These false alarms may lead to a trip to an emergency department, where babies may be forced to undergo unnecessary blood tests, X-rays, and even hospital admission.